My favorite bronzer to use, ever, is Guerlain Terracotta Summer Stones. This was a gift from New York based makeup artist Nat Yordan, who happens to be my BFFL. At first glance, I was a bit apprehensive to use this because there were small balls of different colors! Plus, it was my first time to experience Guerlain, which is a Luxe brand. I was intimidated. After much trial and error, I have come to the conclusion that in applying Guerlain Terracotta Summer Stones, all it takes is finesse. I make sure swirl the bronzer blush lightly in a wide circle, all over the Summer Stones. I pick up the pigments from each Summer Stone by doing so. I then brush it on the face in light strokes. Applying in layers until I reach the desired effect and intensity that I want. I use this product all the time. I use this after contouring and before applying blush. The Summer Stones, softens the contouring and adds dimension to the blush on the cheeks. Creating a gradation of color. I do not use this product when I contour, that is a different product and a different blog all together. I use this product to warm up the face. To give it a nice golden sun-kissed look. This is also the product I use when I am working with a person whose tan is fading. The Summer Stones brings the faded tan back to life and counteracts the grayness caused by the fading. The main reason why I love this product is because of the red pigments mixed into the pearls and the use of delicate gold shimmer. The presence of the red pigments complements the yellow undertones of the skin while the delicate gold shimmer creates a warm radiance. So as an advice, when purchasing bronzer, always buy one whose shimmer is gold. If you’ll buy any bronzer that has silver shimmer on it, you’ll end up looking “ashy”. 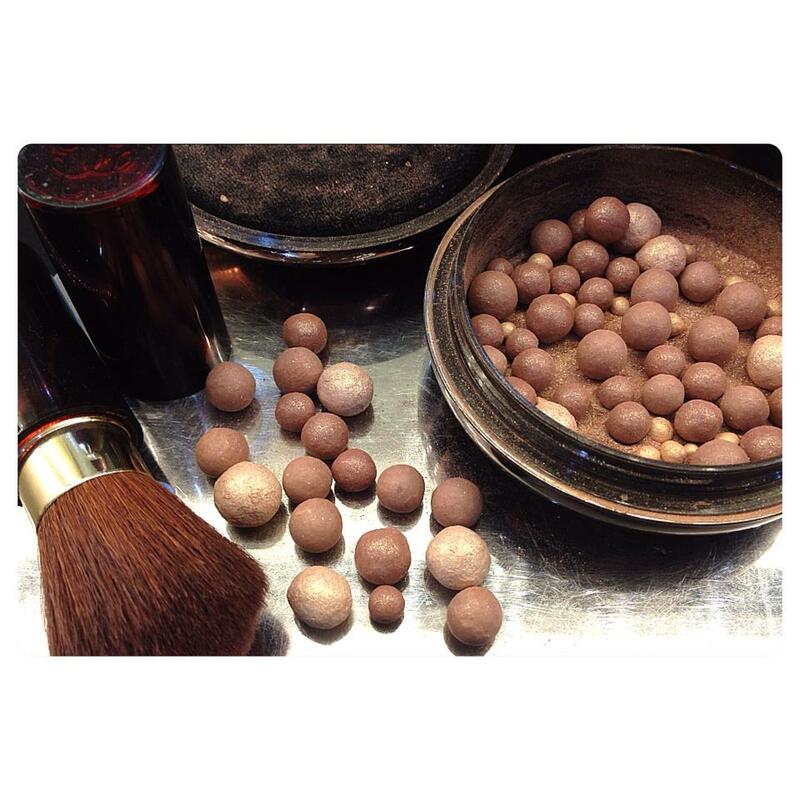 The Guerlain Terracotta Summer Stones comes in a round bronzed shell with a black puff. The Summer Stones has 3 different sized pearls with 4 different hues. One pearl appears to be a matte Chocolatey brown. You have no idea how many times I have been asked by people, if they can have a piece of round chocolate when they see the Summer Stones on display. Another pearl appears to be a luminous copper, this is what gives the skin its sun-kissed look. The smallest pearl is an intense gold that gives warmth to the skin. The biggest pearl, looks like an iridescent white pearl with golden undertones. This is what gives the skin a soft, defocused look. This bronzer actually work with different skin tones. As you can see on the photo below, Sam Lewis (seen on the left), has fair skin. The Summer Stones added warmth and color to her skin. 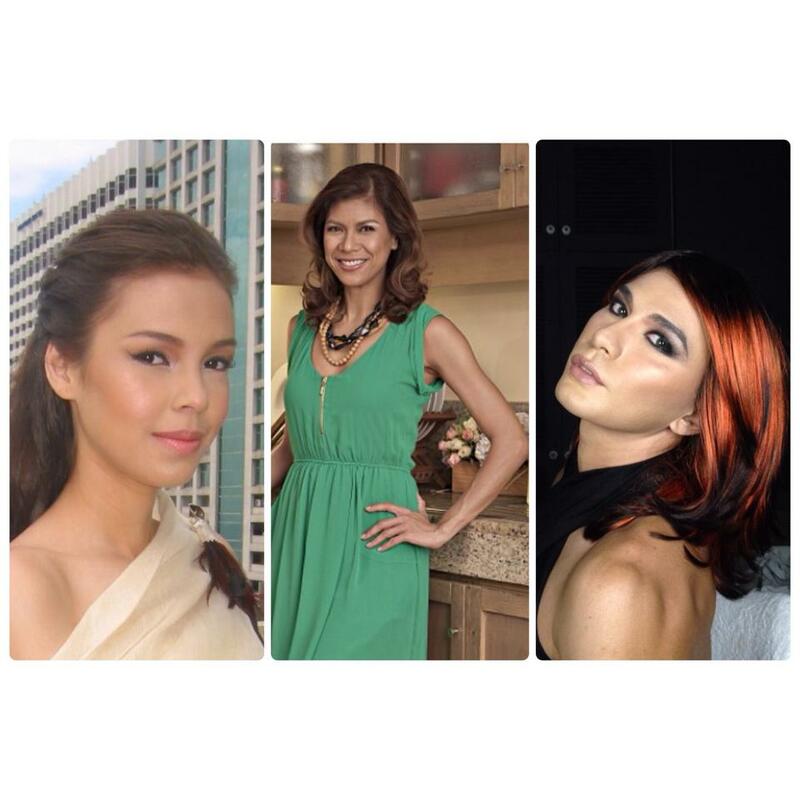 Suzi Entrata-Abrera (seen in the middle), is Morena and loves a tan. In this photo, the Summer Stones deepened her tan and added a warm radiance to her skin. Tora Birch Tree (seen on the right), is sporting a smoky eye look. The Summer Stones gave the skin color, warmth and dewiness that emphasized the smokey eye look without creating the unnecessary distraction a colored blush would have made. Effect of Geurlain Terracotta Summer Stones on different skin tones as seen on Sam, Suzi and Tora Birch Tree. As an added bonus, the Guerlain Terracotta Summer Stones smell so good. It has a light delicate floral scent that I cannot place. Every time I open the pot that holds the Summer Stones, I am enveloped in a scent that feels luxurious, frivolous, and womanly. As a precaution, only purchase scented cosmetics if you are not allergic to any kind of perfume. I believe Guerlain Terracotta Summer Stone first made an appearance circa 2009 (?). Unfortunately, this product is no longer in production. I’ve visited a few Geurlain makeup counters in Manila, Singapore, Thailand and New York and I always leave empty-handed. I tired searching on ebay, I saw one and it sold for £40. In some cached web pages of high-end department stores, it listed as $54. There’s one website based in the Middle East that sells it for a whooping $89.99! pffftt! I’m running out of pearls. I hope the bring this back into production. To visit the Guerlain website click here.